Glance at the masthead of this blog and you'll know something's up. 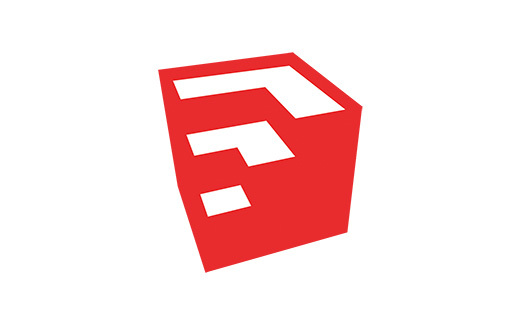 Our new graphic identity is only the most obvious of the changes we've made in SketchUp 8 M4. It's unusual for us to do four maintenance releases between major versions, but then, it's been a bit of an unusual year, hasn't it? Our move to Trimble gave us an opportunity (and an imperative) to finally build a proper graphic identity for SketchUp. In many ways, this was one of my favorite short-term benefits of the acquisition; it always irked me that our tool, which is so good at making pictures, had a logo that consisted of its name typed out in a particular font. Blech. The most distinctive element of our original logo was its big, red U.
SketchUp's application icons have, in my opinion, gotten progressively less good over the years. The last one (on the right) only appeared on Google's More > Even more page. None of these icons were ever really used as product logos. The Google years brought several logos as we responded to successive top-down branding directives. None were particularly inspired, and none solved the we-need-an-icon problem, either. Mostly SketchUp, then mostly Google, then side by side. As we kicked off our new branding effort in June, we were determined to kill two birds with one stone: We would design a symbol (some people call it a "mark") that would do double duty as our product icon. For the mark/icon itself, we were looking for a form that communicated a number of things. Less important were notions of informality and simplicity, though we obviously didn't want our symbol to convey stodginess or head-banging complexity. We focused on the notions of three-dimensionality, dynamism (movement) and perspective. When we saw the sketch of the shape that would eventually become our icon, we knew we were on the right track. It's derived from a cube—which is the go-to symbol of 3D for apps like ours—but it isn't really a cube at all. The implied stairs or levels are an apt representation of our roots in architecture and other construction disciplines. If you look closely, you'll notice the chevrons formed by the top surfaces even point "Up" in a nod to our signature tool. Whereas application icons are often very colorful—with lots of fine detail, gradients and shading—corporate marks need to be much more flexible. They need to be able to scale up and down without looking smudgy or oafish; they need to be able to printed in a single color when necessary; they need to be readable on black, white, colored and photographic backgrounds; they need to be able to be reversed into white sometimes. The best logos look good no matter where you use them. We decided it was best to stick to a single color. But which one? SketchUp's hue has shifted slightly over the years, but it's always been a flavor of red. As we looked at ruby and garnet, crimson and cadmium, burgundy and brick, we kept coming back to a desire for SketchUp's red to be as simple and positive as the rest of our brand. Our choice, Pantone 1795, is saturated, definitely not brown or purple, and stop-sign-visible at a thousand paces. I cheer up whenever I see it. Our new typeface is Whitney. For the rest of the SketchUp Pro family of applications, we derived icons from the SketchUp symbol. LayOut is represented by an orthographic top view of the stair-step shape. Style Builder is an outline of the mark, rendered with stylized edges. All three icons are SketchUp Red, which ties them together and sets them apart. Did you notice the "L" in the LayOut icon? Some of you are probably wondering why we didn’t just wait until SketchUp 9 to change this stuff. The answer is actually pretty simple. With the deadline looming on purging the old Google SketchUp logo from our product, we had three choices: lop off the first word and hobble along without a real graphic identity; come up with an interim solution; or go through the difficult but worthwhile process of solving the problem once and for all. The first option was totally unsatisfying, the second caused more issues than it solved, and the third offered us the opportunity to make a fresh start. It was an easy decision. ...we continue to squash bugs and make SketchUp hum along as best we can. Mosey on over to the SketchUp 8 M4 Release Notes page to see a list of everything that’s better now. Why can't you guys come up with something nice, catchy! As you yourselves admit, the logos get worse by the time, and this one, in my opinion, is another brick in the wall! Do you think it's possible to come up with something better? Great to see some progress coming from Trimble! Excited for the future of the program. As others have mentioned, please make a native linux version if you really want to shake up the market. Schools, training centres, makerspaces and fablabs are centres of change which are all moving towards open source O/S's like Ubuntu, using opensource tools like Inkscape and Blender to fulfill their creative needs. As they are about to be pivotal in the next "industrial" revolution Sketchup should be there too, being integral in that change. I Like new ICONS , feeling SketchUp family. I can't wait for Japanese edition. I wish the LayOut icon fit better with the pixel grid - currently in many of its icon sizes the hard edges end up blurred . I'm not a fan of the new logo. 1. lose the red, Trimble blue is better, it's easier on the eyes and has a more frienly feel to it. 3 Keep the new logo but give us a few versions to choose from. Why don't you guys simply create a logo contest or at least let your users to vote or choose from more options? We would be pleased to help you. I think SketchUp can do much better, whatever it is Trimble or Google. I like the new icons. Too often I see icons that are not symbols but simply illustrations. Because todays screens make it possible to have a realistic icon doesn't make it more easily distinguishable than a stylized one. This new one stands out in my start menu. Good job on the logo text also. This is great! As a brand strategist, I can relate to the insane process it takes to end up with something simple and effective. There is a lot of seagulling before and after. I like it. The new logo, not seagulling. Excellent job! The icons/marks are perfect! and regardless of what the branding is... SketchUp/LayOut is and always will be rad! Keep up the great work! The new icons work well with the Windows 8 design (the icons look like they are part of the new Office series). layout like it was in SU7 . there is "cold" new architecture everywhere . the CPTCHA is unreadable, ten times I have to fill it in!!! godverdomme! but still: SketchUp is GREAT !!! Why would I even install this maintenance release? All I see is an ugly logo and then MAC, MAC, MAC, and again MAC! I work on a PC damn it! and SU, to this date, does not close complex co-planar surfaces. Stop playing around and get serious!! I agree with Olay... quit f'n around and fix the bugs... and while you're at it make some of the plugins native to SU. All of the architects I've tutored have no clue that SU can draw a curve... let alone a complex organic structure. Incorporate plugin only scripts into native SU (artisan, BZ, ferrari, set center, angular dimension; roof, frame, and door/window tools; profile builder, chamfer and rounding tools, all possible geometic shapes, layer manager, better and more common building materials). Also none of the architects I've dealt with have a clue that SU will draw in 2D (the antiquated sheeat they were taught by a certain overpriced software that dominated the market for 25 years. I love SU... and I'd love to see architects, designers, and engineers happily forking out for SU pro... but I know that such people are too busy to find these plugins and menu options... so I'm asking that you peeps make SU the world standard by doing all these things the rest of us expect every new version release... when instead you give us a new logo... love you guys, but I haven't seen much difference since google bought SU. Vote on the new logo ! [Poll] What do you think of the new SketchUp logo designs ? [Poll] What do you think of the new SketchUp logo color ? but please redegin appearance of the application , its too old .. llooks like windows 98 .. not 8 .. The icon looks flat to 3d software... but is nice. I like the typography. I am a freelance graphical designer and I really like the new logo. For me it is without a doubt an improvement. I love sketchup. I can even say that since I discovered it, it became an important part of my life. So when the program that I love so much gets better looks, I am happy. The only thing is, as much as I like design, I am realistic and I know it is not the core of the matter, it is only the shell. I wanted to know what was in the release notes and I found almost nothing. To be honnest, I wouldn't care if Sketchup would look as ugly as Windows 95, as long as it is a damn good program, and more important, as long as it continues to improve. Great addition...good to see change. I will continue to utilize SU professionally. I have always been in love with the pencil and house icon. Logo or no logo, please find an excuse to keep using it. As for the new logo... our love for the product and the people behind it make it bearable. Can I have a T-shirt pleeeeeeeeeeeeeease... times a thousand?! This comment is about the M4 release, as opposed to the logo, which is good, but I will miss the old one. The update for Mac retina display is very flawed. I work on a mac with retina display and the new version displays edges at ONE PIXEL WIDE, just like classic SketchUp. But the whole point of the retina display is that individual pixels are TOO SMALL TO SEE with the naked eye. This is not the point of the retina display. (I am regretting buying this computer more every day.) Also the inferencing indicators such as the cyan dot for "center along a path" etc are also too small to quickly pick up. After 15 minutes I have a headache. Please fix this ASAP. will have to go back to SU 7 until you do. Please help. Please. 3. Right-click on the SketchUp application and select Get Info. 4. In the Get Info window, select Open in low resolution. 5. Close the Get Info window and double click on the SketchUp application to open. Thanks for the workaround. It basically makes it look like it did before, which is fine. It's just too bad that the retina support implementation isn't more graceful. One of the nice things about the display is that it has the potential to make non-anti-aliased splines like Sketchup's look almost like the smoothed splines of programs like Alias or Solidworks. Hopefully version 9 will sort it out. - Open a new model window, and behold a tired old lack of AA again. Oooh. Thaat is niiiice. I'll be careful with it. Can i make a tshirt from this new logo? Wearing for my self. So cool, love it.